More than 50% of the marketed drugs today are derived from natural sources. There are various cancers and diseases which cannot be managed well with the current available drugs. It is, therefore, important to identify new sources of drugs for the future. The biological diversity offered by the oceans shows promise in expressing some lead compounds for diseases which show a dearth of drug options for management. A handful of marine products have been approved by the United States – Food and Drug Administration (US-FDA) because of the involvement of academia and the pharmaceutical industry. However, there are many challenges involved which deter a better and faster process for drug development from marine sources. The current scenario in India is in a nascent phase, but steps are being taken in the right direction to develop a potential source of new drugs. In this review article, we try to give an overview over the history and impending potential of marine pharmacology, with an overlook on the current approved marine-sourced drugs by the US-FDA. We also take a brief look over the challenges involved in the field of marine pharmacology, its current progress in India and possible future scope. Drugs derived from natural products have been in use for centuries, for the management of various diseases. Today, over 50% of marketed drugs are either extracted from natural sources or produced using natural product as template or starting material. It is a known fact that different forms of cancer, infections, inflammatory diseases, and neurodegenerative diseases cannot be treated successfully, giving rise to a continuous need for new drugs. This need is coupled with the development of resistance in many pathogenic organisms to antibiotics and cancer cells to anti-tumor drugs. The approach to drug discovery presently has become much more sophisticated which involves designing drugs based on knowledge of an appropriate biochemical target. Most of the drugs would not have been developed without a natural product, leading science to its biological target. Hence, it appears that a diverse approach, involving all these methods, is the most effective approach. It is necessary to identify the sources of new biological activities and chemical structural diversity. Researchers have claimed that the biological diversity of oceans offers a great promise as a source of drugs for the future. This genetic diversity translates into chemical diversity which can lead to new drug development. In this review article, we will be discussing the journey of marine pharmacology over the last few decades. We will also be discussing about the challenges associated with the drug development from marine sources and also, the future of the same in the world, and in India. The potential of marine natural products (MNP) has captivated many researchers over the last few decades. Inspired by the vastness of our oceans, and an almost incomprehensible level of biodiversity in the marine environment, researchers have enthusiastically pursued the pharmacological potential of secondary metabolites from marine organisms. It has been almost five decades since the isolation of spongothymidine and spongouridine from the marine sponge Tethya crypta by Bergman that eventually led to the development of Ara-C (cytarabine, an antileukemia agent) and Ara-A (vidarabine, an antiviral agent), agents which received United States – Food and Drug Administration (US-FDA) approval in 1969 and 1976, respectively., After the approval of Ara-C and Ara-A as therapeutics, it was not until 2004 that the next MNP would be approved, ziconotide (Prialt1), for the treatment of severe chronic pain. This was soon followed by the orphan drug status granted to trabectedin (Yondelis1) for the treatment of soft-tissue sarcomas and ovarian cancer, and its registration in 2007 in the EU for the treatment of soft-tissue sarcoma. However, after many years of research primarily by the academic community and sporadic involvement of major pharmaceutical companies, only a handful of MNP have been approved. According to latest data, the US-FDA approved drugs of marine origin currently being marketed are enlisted in [Table 1]. MNP pharmacology has evolved from broad surveys of marine life for novel chemical entities regardless of pharmacological activity into what currently is considered the targeted approach to drug discovery. This targeted approach focuses on specific diseases (e.g., cancer, and inflammation) and molecular targets (e.g., specific enzymes and receptors). Early assay-guided fractionation of marine extracts was hampered by limited ability to dereplicate those extracts from known MNPs. However, this issue which can now be accelerated with continued improvements in technology to identify and elucidate MNP structures. The ocean represents a virtually untapped resource for discovery of novel chemicals with pharmaceutical potential. Marine plants, animals, and microbes produce compounds that have potential as pharmaceuticals. These “secondary metabolites,” chemicals that are not needed by the organism for basic or primary metabolic processes, are believed to confer some evolutionary advantage. Marine sponges are among the most prolific sources of diverse chemical compounds with therapeutic potential. Sponges occur in every marine environment, from intertidal to abyssal regions, in all the world's oceans, and they produce a greater diversity of chemical structures than any other group of marine invertebrates. Other marine sources of bioactive molecules with therapeutic potential are bryozoans, ascidians, molluscs, cnidarians, and algae. From a relatively small number of these species that have been studied to date, thousands of chemical compounds have been isolated. However, only a small percentage of these compounds has been tested in clinically relevant bioassays. Since the discovery of penicillin in the late 1920s, terrestrial microorganisms which are mainly soil derived have provided the single most important resource for the discovery of new drugs. However, there are growing concerns about the continuation of this historic approach to drug discovery. In addition, the growing cost of the whole drug-discovery process has made it important for the pharmaceutical firms to find new cost-friendly options for the same. Most of the earth's microbial diversity is found in the ocean. In addition to the typical organisms found on land, many classes of microorganisms exist only in the sea. The photosynthetic microorganisms alone comprise over 12 plant divisions. With the inclusion of the known unique adaptations of microorganisms to high-salt environments and high hydrostatic pressure, the immense diversity of the microorganisms in marine habitats becomes apparent. However, the pharmaceutical industries have not taken advantage of this enormous resource. The reason rests with the tendency of researchers to explore familiar and more readily accessible microorganisms. In the 1950s, it was reported that fewer than 5% of the marine bacteria present in environmental samples could be cultured. This led to the widespread belief that marine microorganisms were simply not culturable. This, together with the traditional lack of cross-disciplinary interaction between marine and medical microbiology, resulted in a great hesitation to embark on an aggressive marine-oriented program. With no guarantees that any new drugs will be found, the risk was difficult to justify. Times are changing and marine microorganisms can now be cultivated successfully.,,, The microbial diversity of the marine environment has thus become available for scientific study, and newprograms are emerging worldwide. In the United States and Japan, intense focus on coastal sediments and organisms associated with marine invertebrates has resulted in a growing number of papers documenting the production of novel, bioactive metabolites. Both bacteria and fungi are now the targets of biomedical study, and fascinating reports of novel metabolites are becoming more and more common. Bacterial samples from coastal sediments, when grown under saline conditions, have yielded new antibiotics, antitumor, and anti-inflammatory compounds., Similarly, when the surfaces of marine plants and the internal tissues of invertebrates have been sampled, bacteria, and fungi have been discovered that also produce bioactive compounds with pharmaceutical potential. Microbiological studies of the deep sea environment have shown the presence of obligate barophiles, bacteria which require pressures as high as 600 atmospheres for growth to occur. These highly adapted marine microorganisms represent a biomedical resource of unknown magnitude, but great promise, as demonstrated recently when unusual compounds produced by bacteria retrieved from deep sea drilling cores were shown to inhibit colon tumor cell growth and prevent replication of HIV, the AIDS virus. Docosahexaenoic acid (DHA) and arachidonic acid are the most abundant polyunsaturated fatty acids (PUFAs) in breast milk and are the predominant structural fatty acids in brain gray matter. High dietary levels of these PUFAs are believed to result in higher levels in the brain, and they have been recommended as nutritional supplements for infants. A marine microalgal species has been discovered that produces large quantities of the fatty acid DHA. It is used in infant formula supplements. Marine-derived nutritional supplements, or “nutriceuticals,” present a new opportunity for research in the application of MNP to human health issues. One important application of the many bioactive compounds derived from the marine environment is their use as molecular probes, molecules broadly defined as nondrug substances which can be used to probe the foundations of important biochemical events. Tetrodotoxin, saxitoxin, conotoxin, and lophotoxin are few toxins which have been found from the marine sources. The functions and overall structures of the membrane channels which facilitate nerve transmission. Knowledge of the function of these neurotoxins has allowed drugs to be designed and targeted to those sites of nerve transmission. Seventy percent of the earth's surface is made up of oceans with a prolific resource of various biological and chemical entities. So why aren't we able to exploit these useful resources for development of useful agents, despite their known medicinal use? There are many pitfalls for the development of marine-sourced drugs on which we want to throw some light. Oceans contain a huge source of useful organisms no doubt, but majority of these areas are still inaccessible to the researchers. The collection of entities at areas easy to reach was favored for a long period. However, the question remains on the inaccessible regions, which needs a good collaboration between researchers and the oceanographer. Developments in the underwater life-support systems have tried to provide new potentials for the exploration of new regions and depths, which should be exploited in a better way. Genetic engineering, which deals with the transfer of genetic information in the host cells from the desired compound, is under expansion for the betterment of drug development. This is an important domain for controlling of the isolation and the expression of genes of the marine organisms, which will help us have a more targeted approach in developing lead compounds from the marine environment. Many times, natural products are isolated from higher marine organisms such as marine invertebrates. These products, which are a product of symbiotic association, are difficult to develop separately from cultures, as their growth depends directly or indirectly on the host. Hence, many a times if these products are tried to develop in vitro, many of the important genes will remain silent., For such cases, the concept of metagenome analysis should be considered, which is very much in an underdeveloped phase. Another important issue is the availability of adequate amount of resources from the marine environment of a particular compound. Only if the pharmaceutical industry is sure that they can very much address the availability issue of a marine compound, if they find the lead compound of marine origin effective in clinical trials, only then they will try to invest into these trials. Ecological feasibility is a valid concern, considering the exorbitant costs of the clinical trials. The cost feasibility will also play an important role when we consider the need of inducing structural modifications to enhance the properties of the drug. India is large country comprising of a coastline which stretched to above 8000 km with a large variety of marine habitats and organisms with potential medicinal use. However, this potential of the massive marine habitat has remained untapped from a long time. There are only a handful of institutes which are trying to explore life-saving drugs from these marine habitats. These institutes include the National Institute of Oceanology in Goa; Central Drug Research Institute in Lucknow; the Bose Institute in Kolkata; Regional Research Laboratory in Bhubaneswar and Central Institute of Fisheries Education in Mumbai. Undoubtedly, the Indian scenario for marine pharmacology is still in nascent phase, but there is potential to tap the resources in a much better way to explore treatments for various clinical ailments. Looking at the massive potential of marine pharmacology, there are several organizations all over the world which are concentrating on research in this domain of drug development. [Table 2] gives an overview of the various MNPs under drug development pipeline, due to their potential effect against various diseases. The various processes involved in the development of marine-derived drugs, right from the discovery of potential novel compounds from marine organisms to extraction and isolation, along with the evaluation of their safety and efficacy are being planned for the future. However, there are many challenges and pitfalls in the development of drugs from marine sources which may be pulling back the pharmaceutical companies from investing in this domain. However, many encouraging findings worldwide, especially related to the field of cancer chemotherapeutics, still gives the domain of marine pharmacology a ray of hope. Certain inhibitors of the signal transduction pathways involved in cancer development have been obtained from marine organisms, and further studies are under process to attain evidence on their efficacy in cancer therapy. There is hope to find drugs of marine origin for targeted cancer therapy that is difficult currently with other available sources. Veeresham C. Natural products derived from plants as a source of drugs. J Adv Pharm Technol Res 2012;3:200-1. Mayer AM, Gustafson KR. 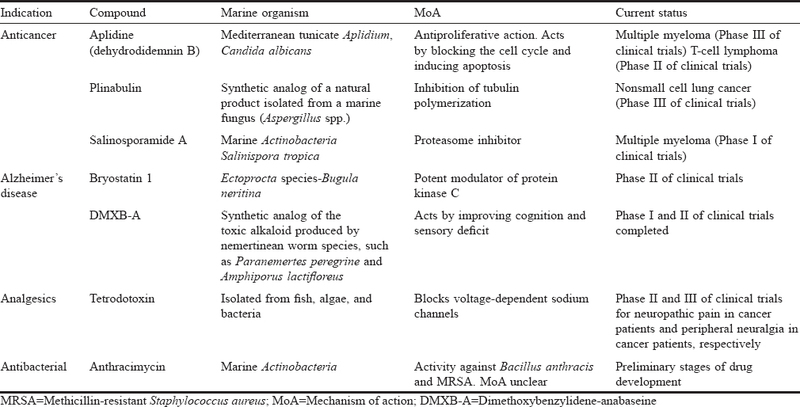 Marine pharmacology in 2005-2006: Antitumour and cytotoxic compounds. Eur J Cancer 2008;44:2357-87. Bergmann W, Burke DC. Contributions to the study of marine products. XXXIX. The nucleosides of sponges. III. Spongothymidine and spongouridine. J Org Chem 1955;20:1501-7. Glaser KB, Mayer AM. A renaissance in marine pharmacology: From preclinical curiosity to clinical reality. Biochem Pharmacol 2009;78:440-8. Klotz U. Ziconotide – A novel neuron-specific calcium channel blocker for the intrathecal treatment of severe chronic pain – A short review. Int J Clin Pharmacol Ther 2006;44:478-83. Schöffski P, Dumez H, Wolter P, Stefan C, Wozniak A, Jimeno J, et al. Clinical impact of trabectedin (ecteinascidin-743) in advanced/metastatic soft tissue sarcoma. Expert Opin Pharmacother 2008;9:1609-18. Mayer AM, Glaser KB, Cuevas C, Jacobs RS, Kem W, Little RD, et al. The odyssey of marine pharmaceuticals: A current pipeline perspective. Trends Pharmacol Sci 2010;31:255-65. Koehn FE. High impact technologies for natural products screening. Prog Drug Res 2008;65:175, 177-210. Arrieta JM, Arnaud-Haond S, Duarte CM. What lies underneath: Conserving the oceans' genetic resources. Proc Natl Acad Sci U S A 2010;107:18318-24. Winston JE. The systematist' perspective. In: Fautin DG, editor. Biomedical Importance of Marine Organisms. San Francisco: California Academy of Sciences; 1988. p. 1-6. Parkes RJ, Cragg BA, Bale SJ, Getlifff JM, Goodman K, Rochelle PA, et al. Deep bacterial biosphere in Pacific Ocean sediments. Nature 1994;371:410-13. Ireland CM, Copp BR, Foster MP, McDonald LA, Radisky DC, Swersey JC. Marine biotechnology. In: Attawayand DH, Zaborsky OR, editors. Pharmaceutical and Bioactive Natural Products. Vol. 1. New York, NY: Plenum Press; 1993. p. 1-43. Davidson BS. New dimensions in natural products research: Cultured marine microorganisms. Curr Opin Biotechnol 1995;6:284-91. Fenical W. Marine bacteria: Developing a new chemical resource. Chem Rev 1993;93:1673-83. Kobayashi J, Ishibashi M. Bioactive metabolites of symbiotic marine microorganisms. Chem Rev 1993;93:1753-69. Okami YJ. The search for bioactive metabolites form marine bacteria. Mar Biotechnol 1993;1:59-65. Trischman JA, Jensen PR, Fenical W. Halobacillin, a cytotoxic cyclic acylpeptide of the iturin class produced by a marine bacillus. Tetrahedron Lett 1994;35:5571-4. Pathirana C, Jensen PR, Fenical W. Marinone and debromomarinone, antiobioticsesquiterpenoid naphthoquinones of a new structure class from a marine bacterium. Tetrahedron Lett 1992;33:7663-6. Yayanos AA. Microbiology to 10,500 meters in the deep sea. Annu Rev Microbiol 1995;49:777-805. Gustafson K, Roman M, Fenical W. The macrolactins, a novel class of anti-viral and cytotoxic macrolides from a deep sea marine bacterium. J. Am Chem Soc 1989;111:7519-24. Fenical W. Marine pharmaceuticals: Past, present, and future. Oceanography 2006;19:110-9. Lindequist U. Marine-derived pharmaceuticals – Challenges and opportunities. Biomol Ther (Seoul) 2016;24:561-71. Marmann A, Aly AH, Lin W, Wang B, Proksch P. Co-cultivation – A powerful emerging tool for enhancing the chemical diversity of microorganisms. Mar Drugs 2014;12:1043-65. Martins A, Vieira H, Gaspar H, Santos S. Marketed marine natural products in the pharmaceutical and cosmeceutical industries: Tips for success. Mar Drugs 2014;12:1066-101. Thakur NL, Thakur AN, Muller WE. Marine natural products in drug discovery. Nat Prod Radiance 2005;4:471-7. Bhatnagar I, Kim SK. Marine antitumor drugs: Status, shortfalls and strategies. Mar Drugs 2010;8:2702-20. Sawadogo WR, Schumacher M, Teiten MH, Cerella C, Dicato M, Diederich M, et al. Asurvey of marine natural compounds and their derivatives with anti-cancer activity reported in 2011. Molecules 2013;18:3641-73.